The US attacked an al Qaeda and Taliban compound in the Bannu district in Pakistan’s insurgency-infested Northwest Frontier Province. Two al Qaeda operatives and two Taliban fighters have been reported killed after an unmanned aircraft Predator fired a Hellfire missile at a compound in the town of Jani Khel. “According to initial information, the identities of those killed were unclear,” an unnamed intelligence official told Geo News. “Neither is it confirmed if there was any high value target” killed in the airstrike. Bannu, a Frontier Region, is outside of Pakistan’s tribal areas. 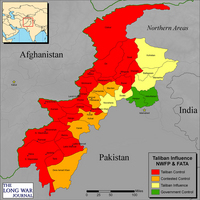 Bannu borders the Taliban-controlled North and South Waziristan tribal areas to the east. According to US intelligence officials and reports from the region, Bannu is effectively under Taliban control. Today’s airstrike is the second outside of Pakistan’s Taliban-controlled tribal areas. The first US strike outside of the tribal areas also took place in Bannu, in the same town of Jani Khel. The Dec. 22, 2008, Predator strike killed at least five people, including Abdullah Azzam al Saudi, a senior al Qaeda leader operating in Pakistan’s tribal areas and the Northwest Frontier Province. Azzam, a Saudi national, served as a liaison between al Qaeda and the Taliban operating in Pakistan’s northwest, intelligence officials told The Long War Journal after the December strike. Azzam facilitated al Qaeda’s external operations network that is tasked with striking against the West. He also served as a recruiter and trainer for al Qaeda. Today’s strike in Bannu is the second in four days. On March 12, US Predators attacked a Taliban training camp and weapons storage depot in the tribal agency of Kurram. More than 24 Taliban and al Qaeda fighters have been reported killed in the Kurram strike. The two strikes in Bannu and the two in Kurram since December 2008 indicate the air campaign is expanding beyond the traditional Taliban and al Qaeda strongholds. Previous airstrikes have focused on Taliban and al Qaeda training camps and safe houses in the tribal agencies of Bajaur and North and South Waziristan. The US has carried out nine airstrikes in Pakistan’s northwest this year. Our intelligence continues to be credible. Intelligence officials said late on Sunday that two missiles fired by suspected United States drone planes killed five people in Bannu. The officials said the dead included two Arabs and three other people. For every such act, US is de-facto making Lashkar e Taiba (LeT), the ISI asset, stronger in taking over the mantle of global jehad from Al-Qaeda. Unless we tackle both the Talibans together – a)Pakistan Taliban aligned with Al-Qaeda and b)Afghan Taliban aligned with ISI, Pakistan – the job will only be half done and will rear its ugly head in many different places. It is after all a fight to survive for Al-Qaeda. And LeT is just waiting in the wings to take over ! The Thunder Run has linked to this post in the blog post From the Front: 03/16/2009 News and Personal dispatches from the front and the home front. On 3/14/09, the Telegraph (UK) printed Barack Obama told: help Pakistan or risk a repeat of 9/11 in America or Britain. The report… will focus on the need to co-opt moderate Taliban elements and shut down militant safe havens in Pakistan’s he lawless northwest border region. It will also urge a sharp increase in military and civil assistance [to Pakistan].